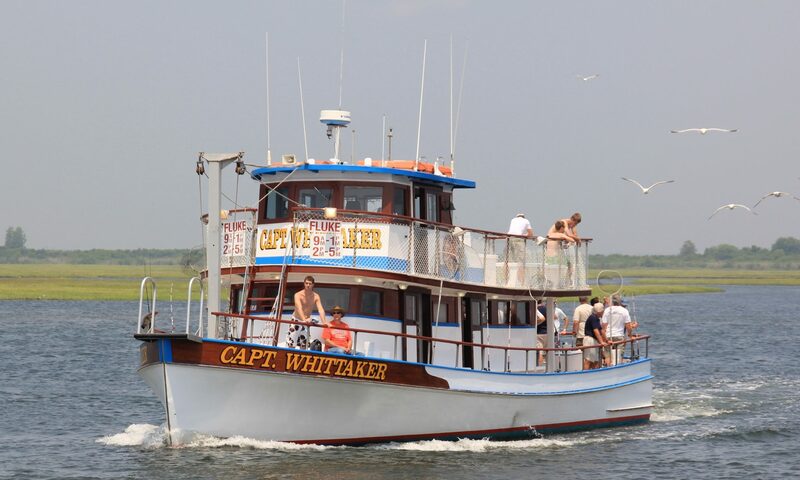 Captree’s Friendliest – the Captain Whittaker Sailing to a Day of Fun and Fishing, a Glorious 9:30 in the Morning! The Captain Whittaker is Fishing for Fluke, 7 Days a Week! 2 Fishing Trips a Day, 7 days a Week! AM Trip: departs at 9am for a 4 Hour, Half-Day Fishing Trip, Arrives Back at the Dock at 1pm. The Captain Whittaker is the only boat at Captree that departs at a convenient 9am in the morning for a Half-Day Bay Fishing Cruise. PM Trip: Departs at 2pm for a 3 Hour “1st time Fishing” Trip, Arrives back at the Dock at 5pm. On all Captain Whittaker Fishing Cruises, we provide the Free Gear You need to Fish; Your Pole, Net, Bait and Hooks. Our mates are on board waiting to help you in all the facets of fishing from baiting the hook to how to cast properly and then to retrieving your catch. We are there to make it fun, exciting and easy. The Captain Whittaker Leaves the dock at Captree State Park at the Scheduled Departure Time. Please arrive 30 minutes prior to the scheduled departure time. Don’t Miss the Boat, Please allow Extra Time for Holiday and Summer Beach and Bridge Traffic. Check in is a 1/2 hour prior to Departure. If you are not checked in a 1/2 hour prior to Departure, We Reserve the Right to give Your Spot Away. Tickets purchased On-Line can be Rescheduled up to 24 hours before Ticket Date, to a Later Date in the Season by Emailing us at info@captainwhittaker.com or calling 631-587-7087. REMEMBER: A Reservation does not imply that the Capt. Whittaker will wait for Late Arrivals. Seniors are 62 years and older. Children are 14 years and under. Organize a Group of 8 People or More and You Fish for Free! Call Captain Rick at 631-587-7087 for the Details. Purchase Tickets On-Line Today. Save Money and Time, Special Internet Pricing!